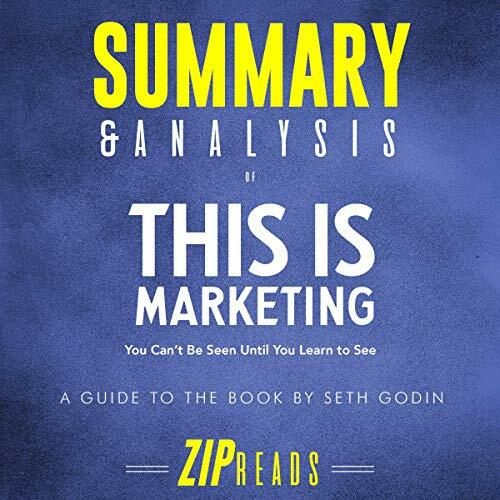 In his 19th best seller, This is Marketing: You Can’t Be Seen Until You Learn to See, Seth Godin turns everything you think about marketing on its head, presenting a simple but novel idea: marketers exist to serve the audience they target. In his book This is Marketing: You Can’t Be Seen Until You Learn to See, Seth Godin presents an original and stimulating theory of how to accomplish effective marketing. This approach centers on making meaningful change and ultimately making people’s lives better. Godin believes that marketers should serve the client, rather than the other way around. Based on 30+ years of marketing expertise, Godin presents a book chock-full of novel ideas supported by fascinating case studies, from Tesla to the National Rifle Association. This is Marketing will forever change the way you define a successful campaign. DISCLAIMER: This book is intended as a companion to, not a replacement for, This is Marketing: You Can’t Be Seen Until You Learn to See. ZIP Reads is wholly responsible for this content and is not associated with the original author in any way.